The bed and jacquard coverlet - black and white - are the stars of the show. Tuscan design beds with their 'cannonball' finials and (sometimes) artful scrollwork don't need any additional detail to look great. Do you like it? Or is the look too austere for your taste? To the left is an 'ornate' version. 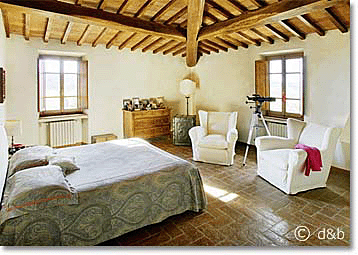 In a rustic bedroom Tuscan style, this is about as lavish as it gets! You'd be hard pressed to find stacks and stacks of sham pillows and accent pillows on beds in Tuscan farmhouse interiors. Tuscan design beds and bedrooms do go with the times, though, and it's not always black iron beds and white bed spreads. Here's a contemporary bedroom in a Tuscan country villa, with a colored bedspread and an upholstered semi-circular headboard. You'll also find white metal beds, as well as wooden bedsteads (some with carved detail) in Tuscan style bedroom decor. For additional information and ideas, have a look at the page about modern, rustic Tuscan style bedroom design, or check out a choice of contemporary Tuscany style bedding. use high-end, elegant (& shiny) fabrics all over it. Above is a more traditional Tuscany canopy bed that uses the same fabric for pelmet, curtains, and bedspread. (Note how the flooring is plain terracotta, but with little square marble tiles added for effect). Now, the one thing I haven't got photos of is Tuscan beds with ornately carved, wooden headboards. not dressed at all (except for a lovely Tuscan style bedspread, of course). So that's your choice of Tuscan beds and bedroom design. I hope you'll find the perfect design solution for your Tuscan (master) bedroom! Complementing Tuscan beds with white Matelassé Bed Linens is the perfect choice for a traditional-looking Tuscan style bedroom. For a more luxurious bedroom look, cover your Tuscan design beds with colorful Tuscan Style Bedding! 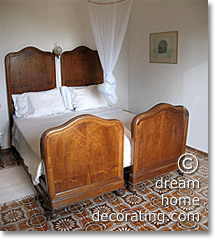 Click these links for a larger choice of Tuscan style beds, e.g. a Black Metal Bed, a White Metal Bed, or a Canopy Iron Bed! Create an even more authentic Tuscany look by adding a Tuscan Armoire to your bedroom! Contemporary Tuscan Design For Bedrooms. And ... have a look at this Tuscan Decor overview! Learn about using neutral color palettes with Tuscan beds (and everywhere else in the house, too!) Understand what makes neutral color schemes look their best, and what happens when you inject 'real' color into neutral color palettes. It's FREE!! 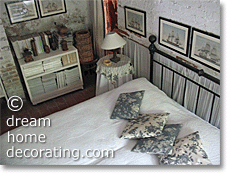 Return from Tuscan Beds to Bedroom Interior Design Ideas. Return to the Tuscan Decor Overview. 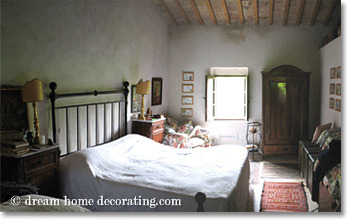 Return from Tuscan Beds to the Dream Home Decorating homepage.